Home > Settings > Coupons > How do I create subscription coupons? How do I create subscription coupons? Coupon Codes may be used by member when they sign up for a subscription or place an order in the web store. Go to the Settings tab --> Click + New Coupon. 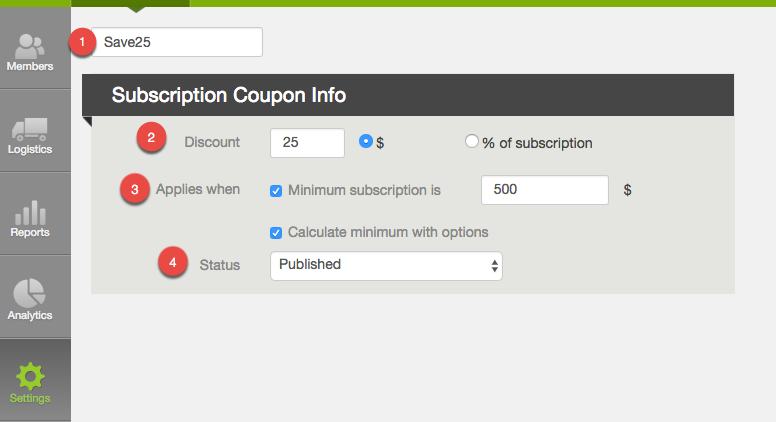 Complete the following fields, select Publish, and save changes; members will then be able to use the Coupon Code. $ - Fixed Dollar Amount: The discount amount entered will act as flat dollar amount discount, which will be applied against the total amount owed when checking out from the sign-up process. The amount will be added as a complimentary payment to the member's account. % - Percentage Off Subscription: This percent discount will apply to the per delivery price of the shares and options selected by the member. This discount will apply to all deliveries unless the discount is removed from the dashboard. 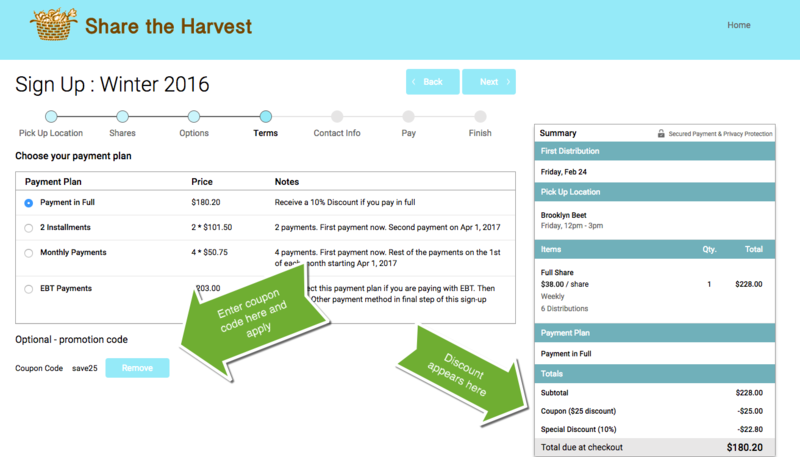 Once one of your coupon codes is published, the coupon code field will appear in the Terms step of the signup process (member join link). Members may select a payment plan, enter the coupon code, and click apply; then they will see the coupon code appear in their order summary.